Few months ago I posted a good review on using Tile Mate Bluetooth tracker. It allows us to track an item we attach it to, or we can use it to find our phone. The battery of Tile is impressive, with 1 year without any charging. But it is also its weakness, because we can’t recharge it, we can’t even replace the battery. Once the battery is empty, we need to get a new tracker, albeit Tile has discounted price offer for existing users. Why won’t I choose a rechargeable tracker instead? Because the technology available today is far from perfect. Removable/replaceable battery would drive the size of a product bigger than it should. There is no point of having a bulky tag that is not practical in most places. Rechargeable battery would not last more than 2-4 weeks. This product is supposed to help people to remember where they put things, not to add yet another thing to remember: charging them. When a tag could only lasts a few weeks, imagine a scenario when we need to find our lost things, we open our phones hoping to “call” our tag, only to realise that the tag is out of power. Bummer. Doing a product with non replaceable battery might sounds counter-intuitive in the first time, but when I re-think of it, it makes sense if such design choice allow a tag to be conveniently small and the battery lasts long enough to the point it does not become a burden. 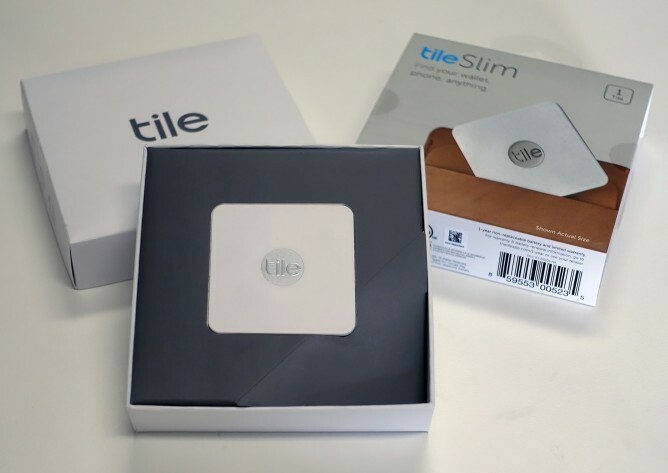 Tile Slim, as the name suggests, is an identical product to Tile Mate with one major difference: it’s slim form factor. Tile Slim dimensions are 54mm x 54mm x 2.4mm. It weighs 9.3 gr, slightly heavier than Tile Mate, but really no one is going to notice 3 gr difference. The 2.4 mm thickness (or I should call it thinness) is the most impressive feature of this tracker. It makes it slim enough to be put inside a wallet without dealing major blow in wallet thickness. Setting up Tile Slim is as easy as following on screen guide from Tile app. After activating our Tile, we can choose to categorise it according to where we use it: keys, wallet, purse, phone, car, bike, backpack, ID badge, briefcase, luggage, passport, remote, tablet, laptop, camera, headphones, spare key, coat, umbrella or other. As a nice bonus, we can also choose the ringtone it will play when we call it. There are only 6 choices available (Bionic Birdie, The Classic Call, Pep in Your Step, Blues for Slim, Jingle Bells and Auld Lang Syne) but for me they are more than enough. The sound from Tile Slim’s built-in speaker is probably not loud enough if we put it inside our bag, but it’s loud enough for my case, using it as key-chain. It’s probably around the same loudness level as Tile Mate. When Tile is connected via Bluetooth to a phone, we can check its location on a map. Of course based on the GPS location of the phone. When our item is lost, we rely on its community-based tracker to find its location. This means, we activate “Notify When Found” feature and Tile will connect to any nearest Tile user within its range and we can track it. I was again a bit pessimistic with how big this community is, but it shows a range of 4800+ people nearby around my home in Melbourne, Australia. Not a bad number at all. Not sure if that 4800+ number counts everyone in Melbourne, everyone in Australia or actually everyone within x kilometres from my location. So far I have not had a single incident of accidentally pressing the Tile Slim button. It happens a fair bit with Tile Mate, being attached at a keychain in my pocket. Basically, it’s a nice product, a happy purchase. No special excitement because everything is essentially the same as Tile Mate which I already use. But Tile Slim delivers what I expect it to do. And that’s all that matters.